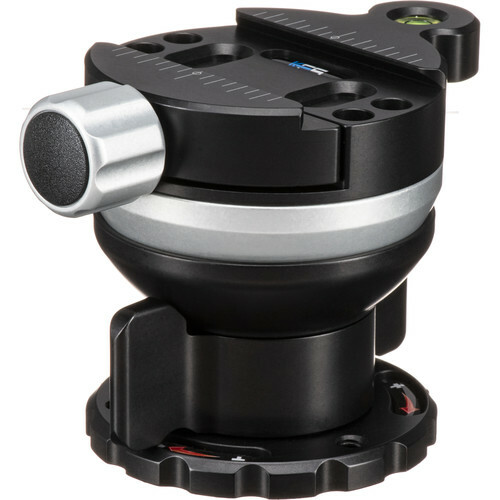 The black and silver satin anodized aluminum and steel TLB-1QRS Leveling Base with TQR-1S Tripod Head Quick Disconnect System and Small Plate from Kirk Enterprises attaches to a tripod via its 3/8"-16 mounting socket. This leveling base has an adjustment range of 32°, which is +/-17° in any direction. You can lock the position into place with the over-sized locking wing nut, and the leveler is capable of supporting a load capacity of 25 lb. This Quick Disconnect System provides a quick release that enables you to quickly switch out many types of tripod heads for different photographic applications. The small plate is designed to fit tripod heads with an approximate base diameter of 2.25" or under. A laser-engraved scale on top of the clamp allows accurate positioning of the plate, which is then secured into place by turning the screw locking knob on the clamp. Set screws are included to secure the clamp to the tripod and the plate to the head and to prevent them from moving while mounted together. In addition, a bubble level is located on the side of the clamp to level out your horizon. Box Dimensions (LxWxH) 6.7 x 5.5 x 4.75"